The video covered today is “How to Treat Diaper Rash”. For this video, I interviewed Dr Lawrence F. Eichenfield, M.D., who is the Chief of Pediatric and Adolescent Dermatology of Rady’s Pediatric Eczema Center, and Professor of Pediatrics and Medicine (Dermatology), at the University of California, San Diego (UCSD) School of Medicine. Dr. Eichenfield’s clinical interests include atopic dermatitis, and serves on the editorial boards of several journals and periodicals, and is Co-Editor in Chief of Pediatric Dermatology. MarcieMom: Thank you Dr Lawrence for helping parents to learn more about diaper rash this week (and on eczema bleach bath therapy last week). Although diaper rash is common, we still need to learn the proper care for diaper rash and when it is no longer a rash to be self-treated. 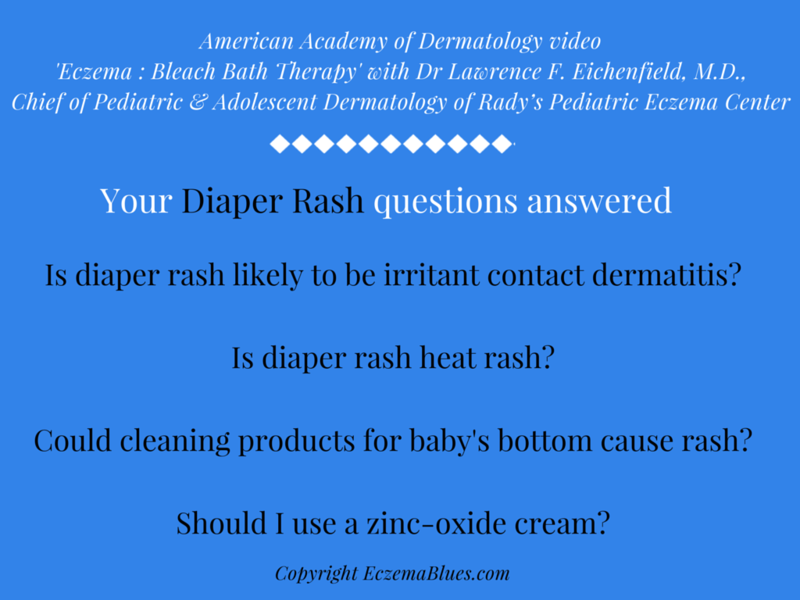 I understand that diaper rash is a layman’s term and the rash is most likely to be contact dermatitis, caused by close contact of the baby’s skin with the urine/stool that act as skin irritant. MarcieMom: Is irritant contact dermatitis the most common form of diaper rash? What are other potential irritants apart from urine/stool? For instance, can the diaper itself irritate? Dr Lawrence: It is true that irritant contact dermatitis is the most common form of diaper rash, with irritation from urine and stools being the most profound irritants. Occasionally children can get inflamed due to other factors, including allergy to diaper contents, though rare, infections such as yeast, which has occurred commonly after courses of oral antibiotics, and many other less common causes of irritation. MarcieMom: We know that babies have underdeveloped sweat glands and thus occlusion and sweat can lead to heat rash/ miliaria. MarcieMom: Is it possible that the diaper rash is a heat rash? What are the other possible diagnosis of diaper rash? Dr Lawrence: It is uncommon for diaper rash to be “heat rash” as the anatomy of the diaper region is different. Aside irritant and occasionally allergic contact dermatitis, there is a broad set of causes of diaper rash which includes yeast infection, psoriasis, and in unusual cases, a broad set of more serious diseases. There are textbook chapters with long list of potential causes of diaper rash, though fortunately, these are uncommon. MarcieMom: We saw in the video that cleaning the baby’s bum is part of caring for diaper rash. Many parents clean with baby wipes which may end up irritating the baby’s skin if the wipes contain methylchloroisothiazolinone (MI) or methylisothiazolinone. MI was named 2013 “Allergen of the Year” by the American Contact Dermatitis Society. MarcieMom: What precautions should parents take when cleaning their baby’s bottom to ensure that the cleaning itself will not further irritate the skin? How can parents tell if it’s their cleaning that cause the rash instead of the contact with the soiled diaper? Dr Lawrence: Parents may be less concerned now, as standard products have dropped MI or MCI from standard wipes. Parents don’t need to be concerned about potential allergy to their cleaning products if diaper rashes respond quickly to standard cleansing and moisturizing regimens, or even interventions with a few days of diaper cream and/or over-the-counter hydrocortisone. If rashes persist with the use of cleansing products and do not respond to standard treatment, then this may be a different story. MarcieMom: It is recommended in the video to use a zinc-oxide based diaper cream. The diaper cream can act as a barrier that limits the contact of the urine/stools with the baby’s skin. Again, we want to avoid the situation where the cream itself becomes the source of irritant contact dermatitis or even allergic contact dermatitis (where the skin reacts to allergen in the cream). MarcieMom: What are the ingredients to avoid when selecting a diaper cream? Apart from the obvious ingredients to avoid such as alcohol and fragrance, can ‘good’ ingredients like vitamin E also trigger a rash? Is it better to stick to a ‘basic’ diaper cream that is mainly zinc oxide, instead of a ‘fancy’ one with more ingredients? Dr Lawrence: Diaper creams that are zinc-oxide based are a tried and true remedy. These produces a barrier layer that protects the skin and also aids in healing of mild irritation or inflammation. Most commercial products have been tested to be safe, with a tendency to be “bland”, meaning a minimal amount of additives being included in the preparations. Parents should be careful with some “organic-based products”, as these sometimes contain contact sensitizers, meaning chemicals that children can become allergic to. Thank you Dr Lawrence for helping with the questions – we certainly are more informed about to care for our baby’s diaper rash and not aggravate it.